Now here's a real find. 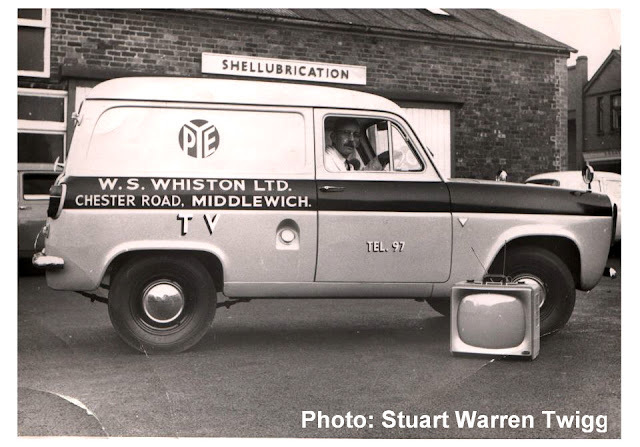 This photo was sent to us by Stuart Warren Twigg, grandson of Harry Jackson who is seen here at the wheel of Whiston's TV van in the early 1960s. 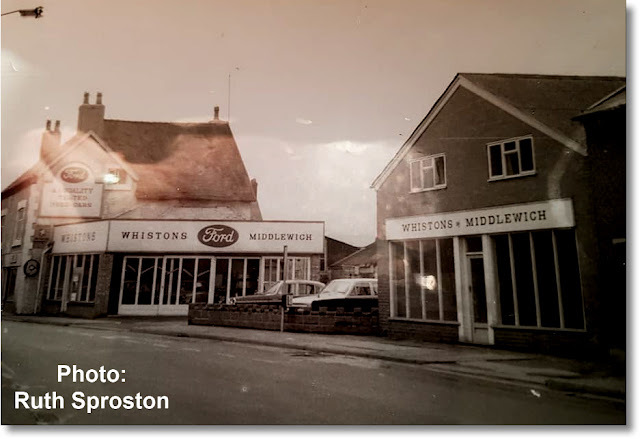 Stuart sent the photograph after seeing this entry in the Middlewich Diary, in which we talked about Whiston's Garage which once stood where Wheelock Street, Chester Road and Nantwich Road all meet. In the course of the ensuing discussion Geraldine Williams remembered Whiston's radio department which was behind the camera. We think, from the look of the van and the TV set next to it, that this picture comes from the early 1960s when TV rather than radio was the dominant form of home entertainment. The van driver is Harry Jackson, Stuart's grandfather. As Geraldine mentioned in our earlier discussion the radio department was run by Harry , who later moved just a short distance down the road to Douglas Williams and Co which was based at the shop now occupied by the Easy Tan Tanning Salon. Another one of nature's gentlemen, Harry was the epitome of old-fashioned courtesy and customer service. The buildings just visible on the extreme right are the Crosville Garage (later T&M Autoparts, the MoCoCo cafe and now apartments run by the same organisation) and Gater's Bakery, the front part of which was empty for many years and has now been incorporated into those apartments, only the old shop fascia board giving away the secret that it was once a shop. Note: Part of that fascia board can be seen on the extreme right of the picture, just above the white vehicle. Can anyone decipher the lettering? The Whiston's building seen here, bearing that enigmatic word SHELLUBRICATION which was seen everywhere in those days, disappeared long ago and all that can be seen on the site in the present day is some shrubbery separating the bus lay-by in St Michael's Way from Red Cow Court. There was also a bus stop, associated with the Crosville garage across the road, on the site. The main Whiston's buildings, i.e. the Garage and radio and TV shop, were further down the road opposite the end of Nantwich road, as can be seen in that earlier Diary entry. It all sounds rather like a scene from 'The Prisoner'. The smart looking TV set would enable you to watch BBC Television on Channel 2 or Granada TV/ABC on Channel 9. It was, presumably, made by Pye of Cambridge. The Whiston's of Middlewich building to the right is the one bearing the enigmatic word SHELLUBRICATION in our main photo. The grassed area with trees shown in our July 2017 shot replaced it. Harry's van was parked approximately where the left hand vehicle is in this picture, and St Michael's Way now comes in from the right and straight across the photo, sweeping away the left hand buildings, to join Nantwich Road, Newton Bank, Wheelock Street and Chester Road in a complicated series of junctions. The building on the extreme right still exists and is the white building with black edging in our 2017 photo, comprising a small cottage and a nail salon. Red Cow Court was, and still is, behind that building. So it's highly likely that Whiston's building and the present-day grassed area was the site of the Red Cow public house many years ago. Geraldine Williams: We had one of the early TV sets from Whiston's in the 1950s - I think it was in time for the Coronation in 1953 and I seem to remember our sitting room being full of neighbours and relatives who came to watch the ceremony. This also happened for the Cup Final! The TV was a console model with a 9" screen. My father eventually bought a magnifying screen on a stand which was supposed to enlarge the picture and also prevent light reflection. By the look of this picture the business, and the TVs seem to have progressed a lot and I suspect this van is a new addition. Harry looks very pleased with himself! Michael Tully: Harry Jackson was one of the nicest guys ever. Absolutely great photo of a great man. Hilda, his wife, was fantastic too. Dave Roberts: You're right, Michael. That is a fantastic find!!! Thanks for the kind words Michael, although Harry's wife was Elsie!